gardening in the boroughs of nyc: The apple does not fall far from the tree! Really. The apple does not fall far from the tree! Really. 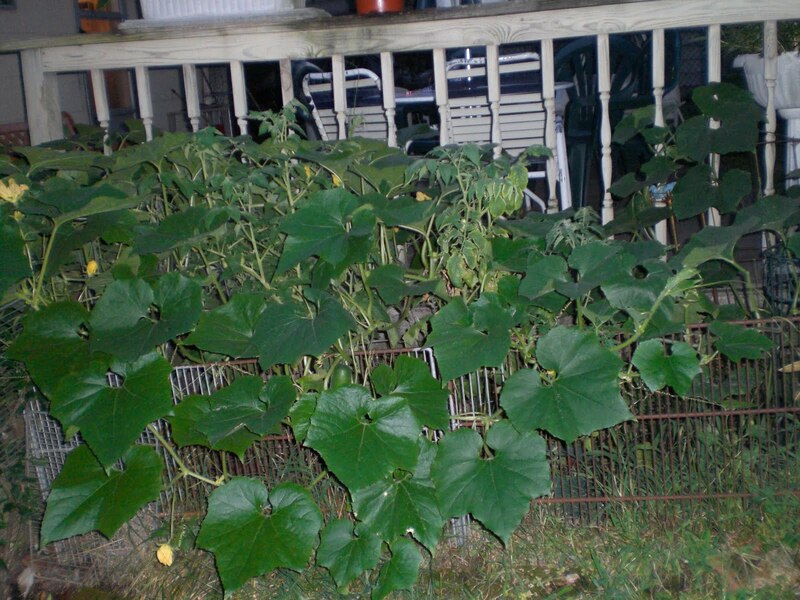 Everything I know about gardening I learned from my dad. I was born in New York City and we didn't do any gardening there, and when he moved us from the big city to the suburbs of New Jersey, I remember the first thing he did was to create a vegetable garden in the backyard and a flower bed in the front yard. Dad was eager to show us how to garden, he taught us how to plant seeds, and transplant seedlings. As a kid I wasn't that interested in gardening because dad would give us chores, like I vividly remember collecting marigold seeds and squash seeds. He also made us do the weeding. Oh how I hated that, and still do!! When I went home last week to visit my parents, he proudly showed me what he was growing in the backyard. 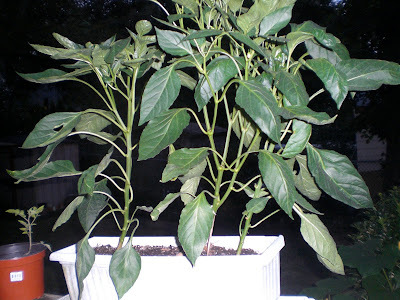 Here are the green pepper plants! I gave him these seedlings that I grew from seed way back in April. His plants are much healthier than mine. He definitely has the green thumb! Here is the Chinese Mao Qwa squash he is growing. The plant is gigantic! It pretty much is choking the tomato plants in the middle. Can you see the tomato plant? 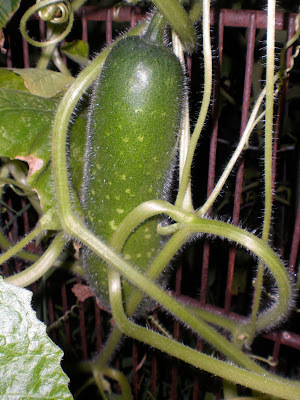 The Mao Qwa squash is a hairy squash. It has little tiny hairs all over the skin. It's also called hairy gourd or fuzzy gourd. It has a mild flavor and is mostly used in soups. Dad was so excited about everything he was growing and talked about how he would be harvesting a lot of squash soon. His excitement made me smile! As we were standing there talking, I couldn't help but think, this is how excited I get when I see my veggies growing too, and I thought, WOW, I'm just like my dad! They are looking good! Hopefully you will have a successful harvest in a few weeks! I enjoyed seeing your dad's plants. When I read about your dad being excited about things in the garden, I was thinking that sounds like you, then read what you said about you being like him. Cool! I've never heard of that squash. What a nice way to pay tribute to your gardening mentor, your Dad. :) He definitely has a green thumb, everything looks very healthy. Sweet post. Glad you are enjoying the garden like your Dad does. What a sweet post! That squash looks so interesting. Does one remove the skin, or eat it fuzz and all?